Available in two versions, Weathershield™ HD Polyester or Weathershield™ Airflow Classic Polycotton – a breathable material that reduces condensation and helps regulate the interior temperature. The Touring AIR is designed to sit alongside your vehicle, providing the maximum amount of space without extending beyond your pitch. The large connecting tunnel can easily be attached to your vehicle and has a generously proportioned side door. This tunnel is capacious enough to be used for additional storage. 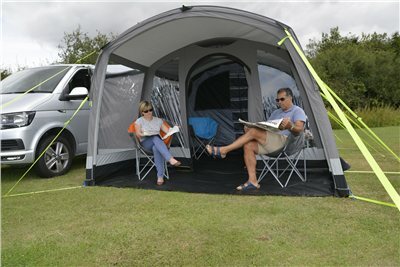 The Touring AIR has a large front canopy, providing protection from both good and bad weather and allows the front door to be opened when it’s raining. Once inside you’ll find a huge living space that has plenty of windows, all with zip-up blinds, and three doors, all with mosquito mesh screens. A large four berth inner tent is supplied as standard that can be used for sleeping or even storage if required. The Touring AIR is available with the connecting tunnel in a left-hand (L/H) configuration for UK vehicles and right-hand (R/H) for European vehicles. Weathershield™ 6000mm fabric - Durable and extremely weather resistant, this material’s been protecting caravanners and motorhomers since 2008. We’ve improved the coatings to make it even better. Weathershield™ Airflow Classic polycotton material - A breathable high quality polycotton material that provides all the protection of our polyester materials whilst also offering superior comfort. Our Classic material allows the awning to breathe which reduces condensation and helps regulate the temperate keeping the inside of the awning cooler on warm days. Please Note: The Hayling 4 Air Vestibule and the Air Canopy both work with this awning. Overall this is a great awning, and I love the inflatable poles! I’m 75, and put this up on my own with no problem until it came to attaching to the van. My van is high but short wheelbase and has no gutter or rail, so I was relying on the guys over the top. These are almost too far apart on my van, and they could do with being another half metre longer. An extra one in the middle would be good too, and straps would be better than cord. I’m going to have to figure out another way to fix it to the van. We have had all sorts of weather this week though, and it has been great having so much space.